After his move to Australia in 1926, Axel Poignant’s life was marked by numerous hardships and tribulations that took him from Sydney – where he occasionally worked as a farmhand - to Western Australia. Beginning his professional career as a photographer in Perth, Poignant’s work evolved from studio portraiture to a steady engagement with photo-documentary. This was a consequence of some of the industrial commissions he received in mid 1930s and his disenchantment with the limitations of the conventional pictorialist approach. 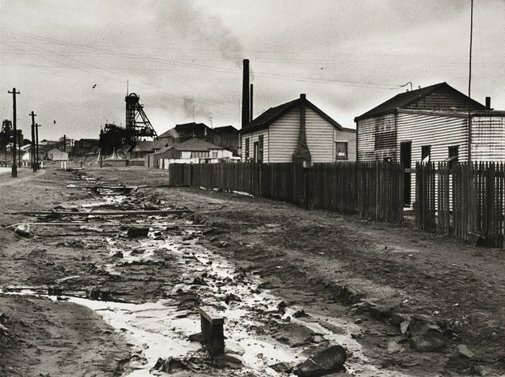 During the late 1930s, Poignant felt a sense of dissatisfaction with the direction his work was taking and ‘abandoned all attempts to be “artistic” by externally imposed formulas’, directing his skills instead ‘to some useful purpose’.1 ‘Storm over Kalgoorlie’ is an early sign of this shift towards more socially committed documentary photography. The image forms part of a photo-series – a format with which Poignant became fascinated with thanks to exposure to overseas photo journals. Conceived independently while the photographer was making portraits of schoolchildren in the gold-mining town, the bleakness of the scene relates the experience of living in a place which inevitably would perish once the mineral resources were exhausted. Indeed, when exhibited, Poignant added the following caption to the photograph (which was then titled ‘Miner’s homes’): ‘In the heavy storm of 1936 two children were drowned in a subway (ie. storm water channel) into which this drain empties.’2 This tragic undertone and the humanism, coupled by the sharply realistic aesthetic of the photograph were rare in Australian photography of the time. Despite the lack of interest from magazines (only a few postcards from the series were produced) this early interest in reportage strengthened and led to Poignant’s remarkable images from The Canning stock route and Arnhem Land. Signed and dated l.r., pencil "Axel Poignant 1981". Dated c. verso, pencil "... 1936".